FRIS-1 (2016) "The Future of Religion & InterSpirituality"
L to R: Cynthia Brix, Thandeka, Michael Spezio, Rory McEntee, Deepa Gulrukh Patel, Netanel Miles-Yépez, Tessa Bielecki, Otis Smallwood, Jamal Rahman, Allison DeHart, Will Keepin. 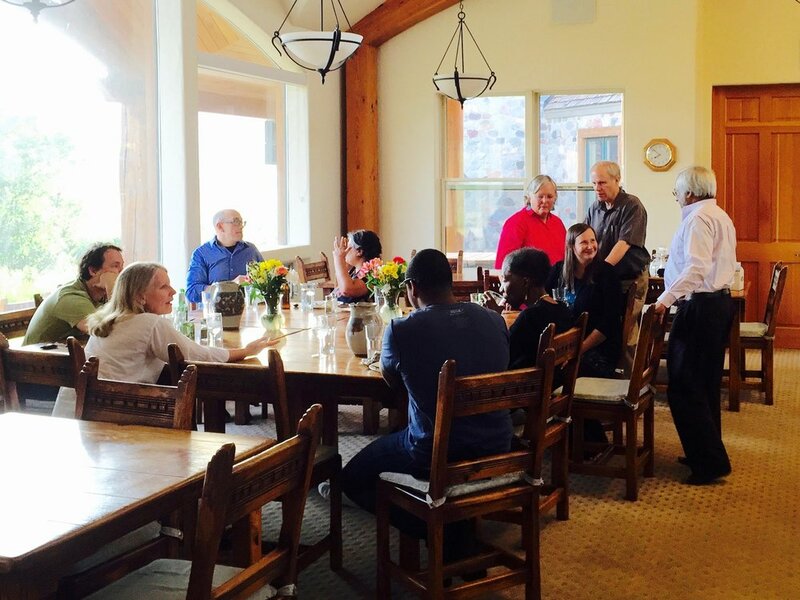 The inaugural FRIS dialogue-retreat on "The Future of Religion & InterSpirituality" was held June 25-29, 2016 at St. Benedict’s Monastery Retreat House in Snowmass, Colorado. St. Benedict's Monastery is Trappist or Cistercian monastery of the Catholic Christian Church. It is home to Father Thomas Keating and Father William Meninger, two of the architects of the Centering Prayer movement, whose retreats are regularly held at the monastery retreat house. Dialogue with Fr. Thomas at St. Benedict's on June 27, 2016. R to L: Rory McEntee, Will Keepin, Thandeka, and Fr. Thomas Keating. Photo by Allison DeHart. 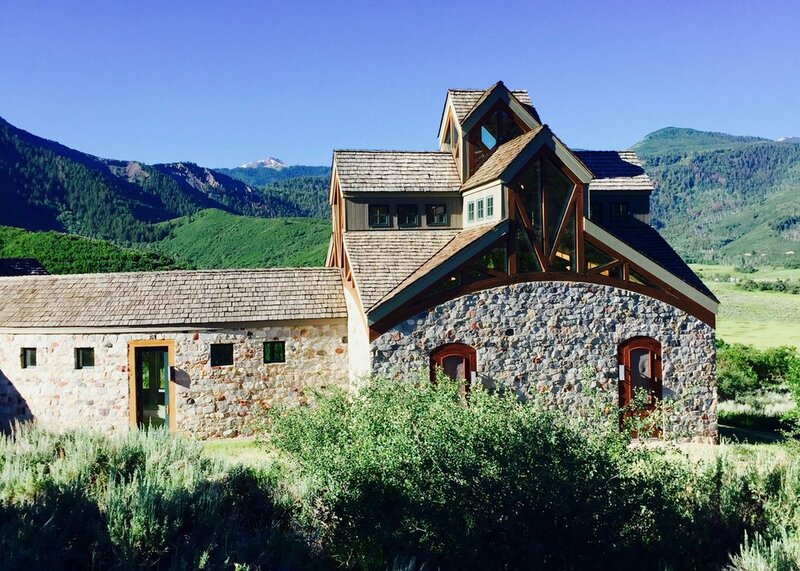 As the FRIS (Future of Religion & InterSpirituality) Dialogues are modeled on the Snowmass InterSpiritual Dialogues (2005-2015), themselves the successor to the groundbreaking Snowmass Interreligious Dialogues (1984-2005) convened by Father Thomas Keating, St. Benedict's in Snowmass was chosen as the site of the first dialogue-retreat so that Father Thomas might meet with participants and give his blessing to the new dialogues inspired by him. St. Benedict’s Monastery Retreat House. Photo by Netanel Miles-Yépez 2016. Tessa Bielecki, Christian Carmelite hermit and co-founder of the Desert Foundation. She is the author of Holy Daring: The Earthy Wisdom of St. Teresa, the Wold Woman of Avila. Cynthia Brix, interfaith minister and co-founder of Gender Reconciliation International. She is contributing author of Divine Duality: The Power of Reconciliation between Women and Men. Will Keepin, mathematical physicist, transpersonal psychologist, and co-founder of the Satyana Institute. He is the author of Belonging to God: Science, Spirituality, and a Universal Path of Divine Love. Deepa Gulrukh Patel, universalist Sufi teacher of the Inayati Order and Executive Director for the Zenith Institute, a four-week Sufi meditation camp in the Swiss Alps. Jamal Rahman, co-founder and Muslim Sufi minister at Seattle's Interfaith Community Sanctuary. He is the author of Spiritual Gems of Islam and Sacred Laughter of the Sufis. Michael Spezio, social neuroscientist, contemplative, and professor of neuroscience at Scripps College. He is co-editor of Routledge Companion to Religion and Science. 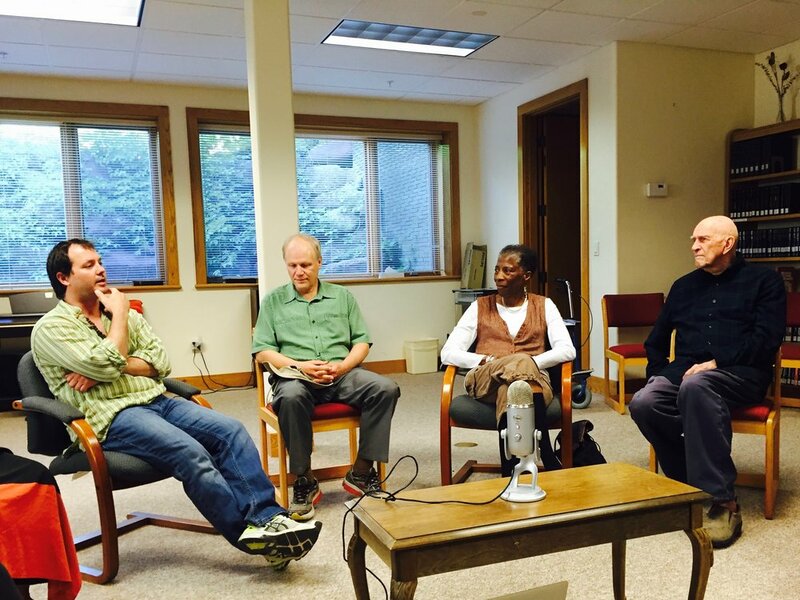 Thandeka, Unitarian Universalist minister, affect theologian, and professor of theology. She is the author of Learning to be White: Money, Race and God in America. Observer participants included: Otis Smallwood and Allison DeHart. Around the lunch table between dialogue sessions. Photo by Netanel Miles-Yépez 2017. See the Facebook group, "Future of Religion & InterSpirituality," for updates on and the continued dialogue of the FRIS-1 alumni.